The tulip has become synonymous with the Netherlands. Tourists from around the world visit the country just to see the bright colored flower and the astonishing view over the flower fields. The small Dutch town called Keukenhof is considered the world's largest flower garden. 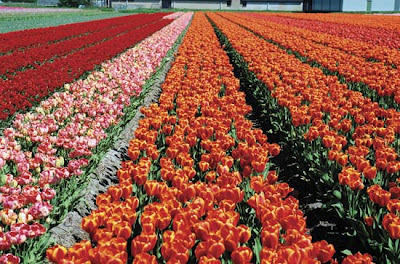 According to the Keukenhof Park officials, approximately seven million flower bulbs are planted annually in the park. During an eight week Tulip festival 800,000 people come to see the Garden of Europe which is one of the most photographed sights in the world. Netherland owes its tulip heritage to the Ottoman Empire. The Tulip was originally a wild flower, growing in Central Asia. It was first cultivated by the Turks as early as 1000 AD. In the Ottoman Empire, tulips played such an important role that the reign of Sultan Ahmed III (1703-1730) has been labeled the "Tulip Era". Three hundred years before Dutch and British horticulture societies got together to propose the first classified list of tulip names, Turkish florist-in-chief in Sultan's court was heading a council to judge new cultivars of tulips and was giving them fanciful and poetic names; some examples are: "Those that burn the heart", "Matchless Pearl", "Rose of colored Glass", "Increaser of Joy", "Big Scarlet", "Star of Felicity", "Diamond Envy", or "Light of the Mind". Only the most flawless cultivars were entered into the official tulip list. The Turkish florist standards preferred only tall thin tulips, narrowly contoured and made up of dagger-shaped petals. The petals had to be smooth, stiff, of one color, the exact size and length, petals of narrow pointed tips, and with no gaps. At the end of the 16th century the tulip arrived in the Netherlands and immediately became very popular among the upper classes. The word Tulip is derived from the Turkish word for turban "tulbent". It is difficult to establish the exact date of the first cultivations of tulips in the Netherlands, but it is generally admitted that around 1550 the bulbs reached the country on ships arriving from Istanbul. The first documented flowering of tulips was in 1594, in the Hortus Botanicus (Botanical garden) of the University of Leiden. The bulbs were brought to the university garden from Vienna by Carolus Clusius, previously responsible for the Imperial Garden in Vienna. At that time Austria was under Turkish cultural influence, expressing itself among others in the oriental fashion and the new habit of drinking coffee. As the Netherlands went through a period of unprecedented economic boom in the first half of the 17th century, competition among growers started, who will have the most beautiful tulip. People were ready to pay extraordinary sums of money for a single bulb. It seemed that if they would have carefully cultivated their tulips they could have never lost, getting more and of precious bulbs, while the prices rose constantly. Slowly the intense speculation started and batches of some rare bulbs had a higher price than a house and were growing in value. In 1635, a set of 40 bulbs has been sold for 100,000 florins while a medium yearly income in the Netherlands at the time was 150 florins. In 1636, stock exchanges were established to trade in bulbs and their future options. Despite the different attempts by the authorities to limit the craze, the trade grew and people were selling land, houses and valuable objects to invest in tulip bulbs. The most famous bulbs as Viceroy or Semper Augustus were priced at thousands of florins. The Dutch called this phenomena themselves ironically a windhandel (trading in wind). Indeed, in 1637 the market crashed, leaving some traders enriched, but most of the public with just some pretty flowers. Today, the tulip mania, tulipomania or tulip madness is used as a term for any economically absurd group craze where speculation borders with senseless gambling. The Dutch, although a bit ashamed of their own past behavior, still love tulips.